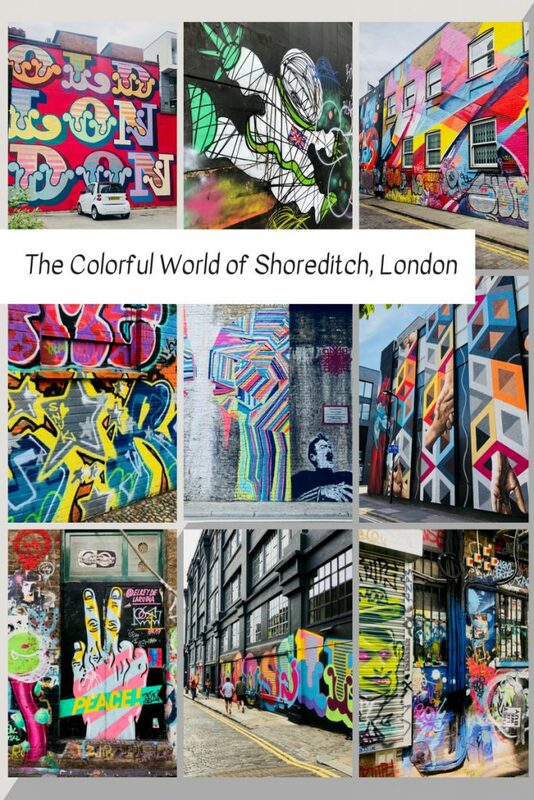 Welcome to the colorful world of Shoreditch! 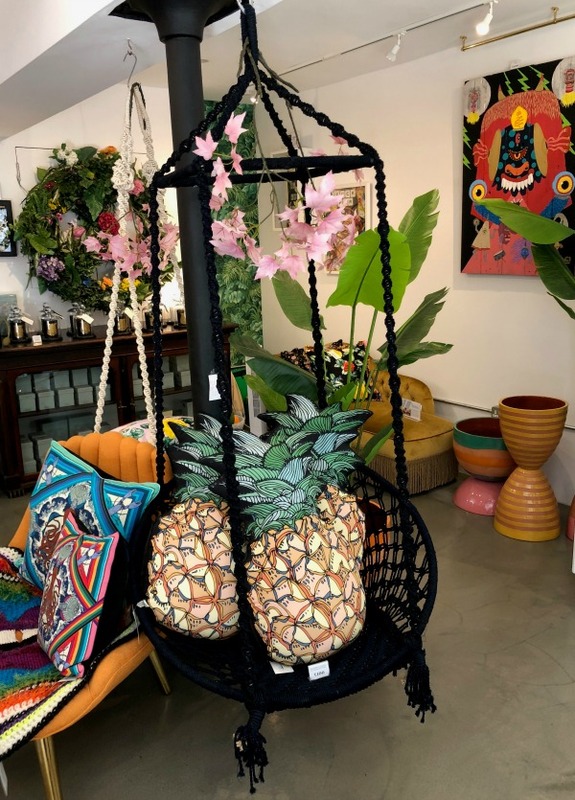 If you are someone who likes to know where the trendiest things are happening and where the cool kids are hanging out, then sit back and let me tell you about Shoreditch. 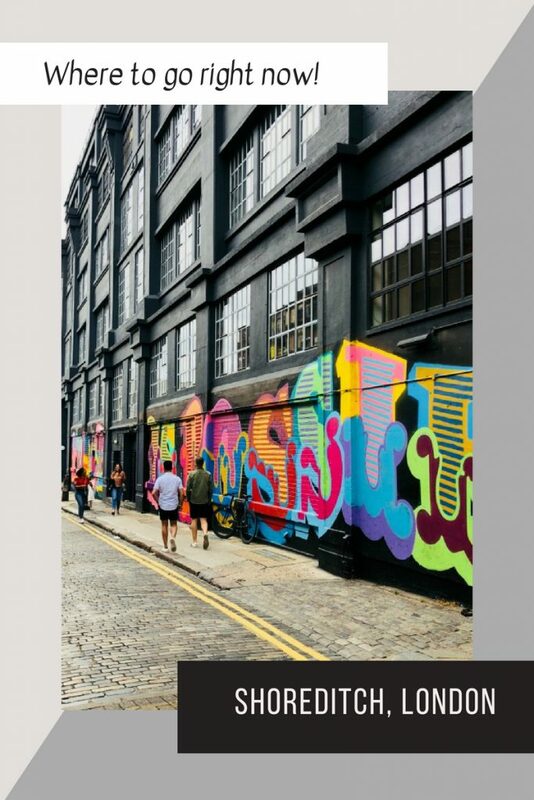 Shoreditch is the hottest neighborhood in London right now; it is gentrification on steroids. 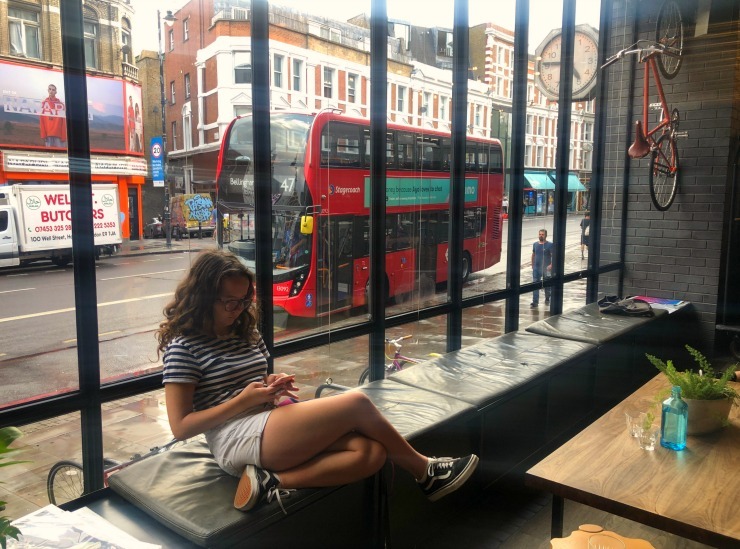 When looking for where to stay in London I found a deal at the Ace Hotel Shoreditch. 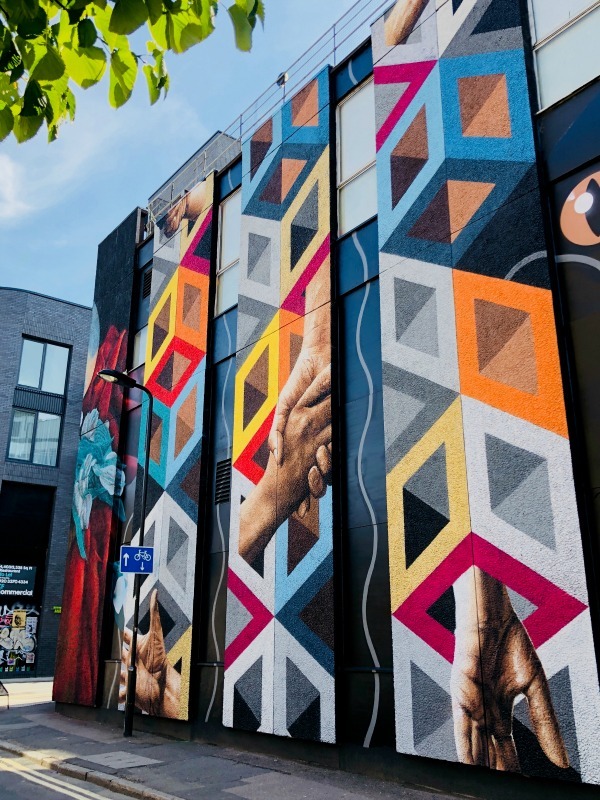 I had never heard of Shoreditch before so I asked my friend who lives in London if she knew about the area and she said: “Ohhh that’s the coolest neighborhood in London right now”. I booked it immediately. We actually ended up staying in Shoreditch twice. First for just two nights before we dropped the kids off at their XUK summer camp and then because I needed to see more of it, we stayed for four more nights when picking the kids up from camp two weeks later. I’ve stayed at Ace hotels before, but I didn’t love this Ace Hotel, the beds were on the floor and not comfortable at all, not to mention when we checked in the lobby looked like a college campus or an overcrowded co-working space. So we booked The Courthouse Hotel for when we came back and that hotel was much better for us, the rooms were larger, the bed was extremely comfortable and well, I’ll talk more about why that hotel is awesome later. Shoreditch is the epitome of 21st century cool. 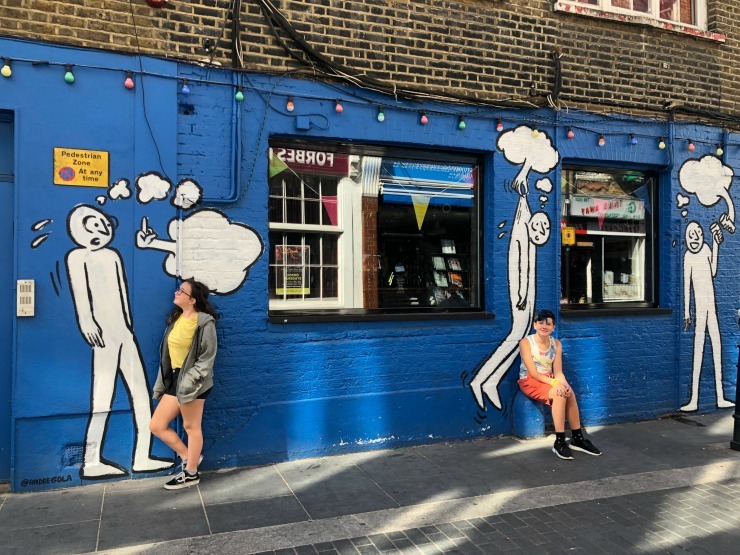 Although I liked to think I’m still pretty young and hip, walking around Shoreditch quickly made me realise that I am neither of those things! LOL, but that’s okay because I loved soaking it all up anyways. 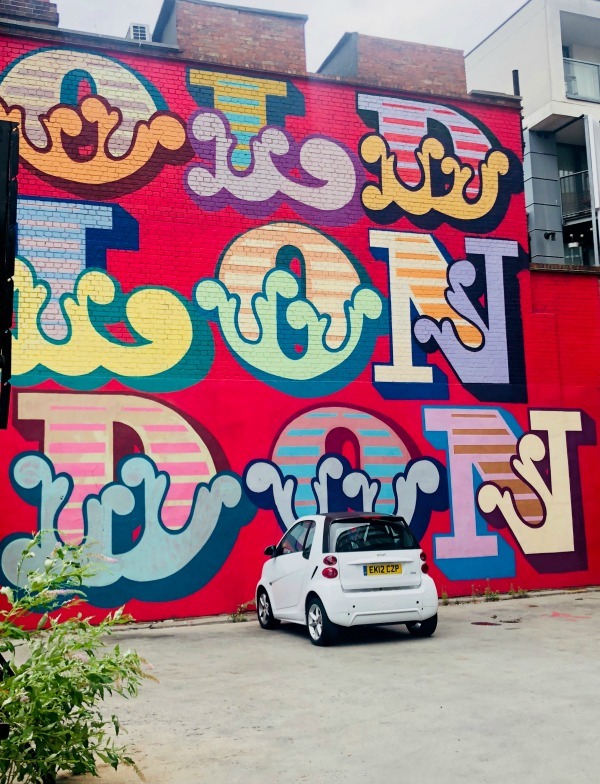 Shoreditch is on the East side of London and so it is a great place to stay, close to London Bridge, Tower Bridge, the new Borough Market, and the Tate Modern. It is also just a short underground ride over to Covent Garden, SOHO and Chinatown which are all great places to walk around with the kids. 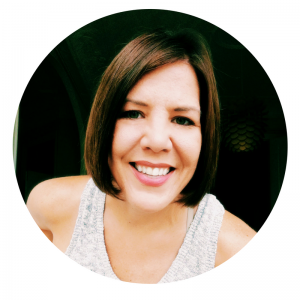 I really like staying out of the popular tourist areas – that chaos drives me nuts. 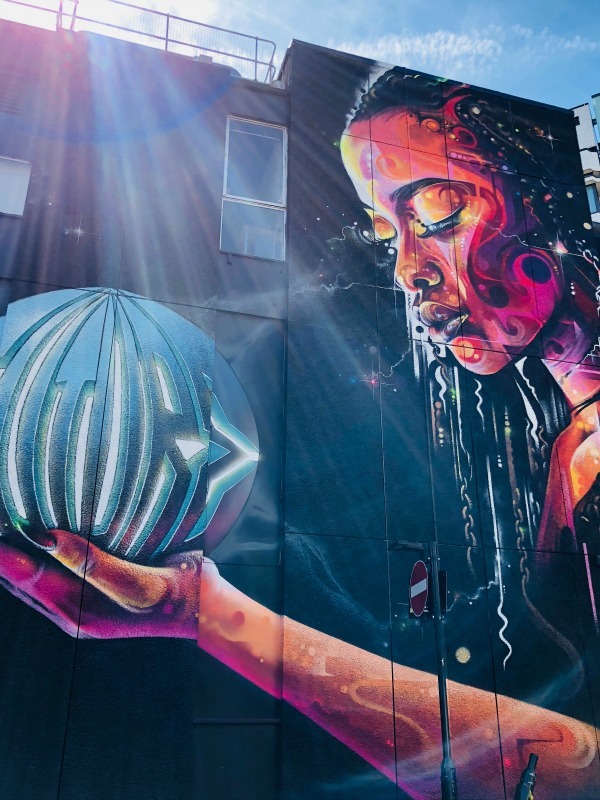 Walking around Shoreditch I felt like I was in a little bubble of the future or in a moving art gallery because there is street art absolutely everywhere, on almost every street and building. 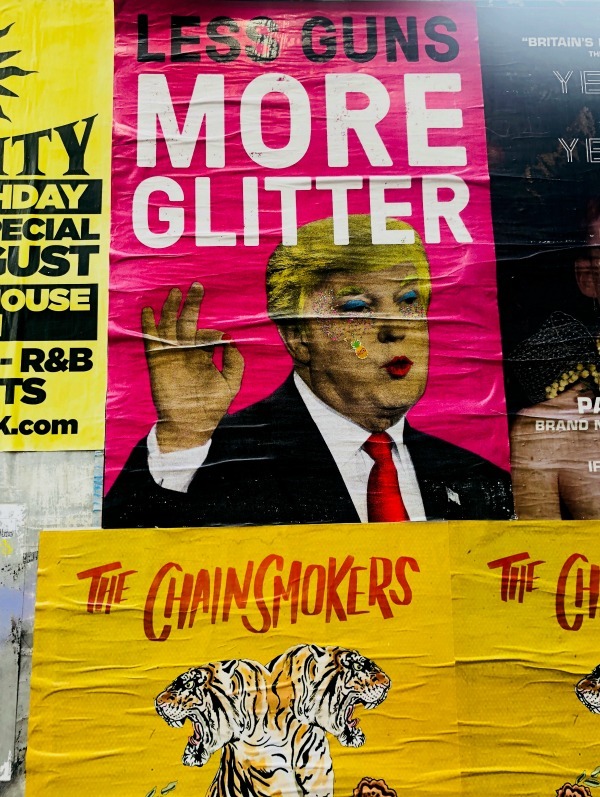 There are so many bars and restaurants in Shoreditch that at the weekends the streets are filled with Londoners partying, and heck, even on a Saturday afternoon we walked by a club that had base booming at 3:00 in the afternoon. Apparently, day clubbing is a thing. But besides the partying millennials, there are master chefs opening restaurants in Shoreditch and high-end boutiques going in as well. So while some corners of this neighborhood may look a little sketchy, trust me, it is not. My kids are well-traveled teens, so staying in Shoreditch was great, they have also been to London before, so they’ve done Buckingham Palace, Big Ben and all those attractions that we did not need to see again. I usually try to find the more interesting neighborhoods to stay in because I know my kids will appreciate some of the unique things we find as well. 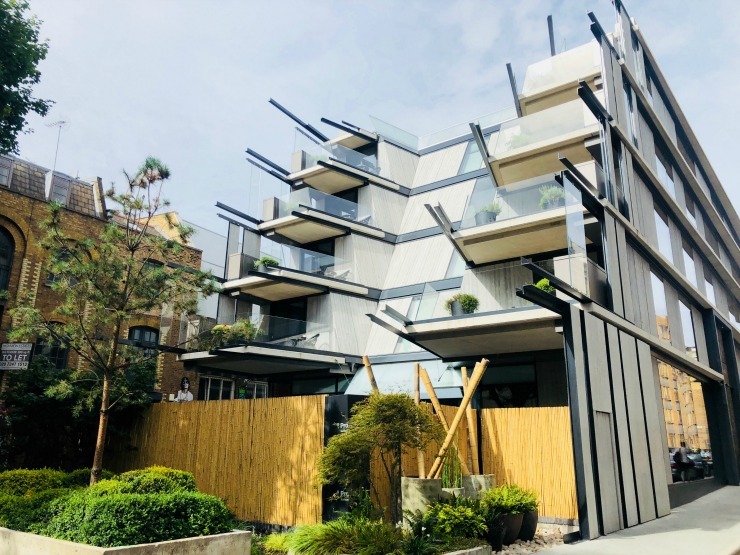 The brand new Nobu Hotel just recently opened and the architecture and design from the outside is hard to miss. The Hoxton Hotel is also fantastic, the lobby is anything but a hotel lobby. The lobby is a gigantic lounge, bar, restaurant, coffee shop and co-working space all in one. We also stopped by the chic Curtain Hotel for a drink at the Green Room, I loved it here. There is also a new Citizen M, the latest in budget hotels that are modern, stylish and super affordable. And finally… there is The Courthouse Hotel, which was actually the old courthouse until 1998. This courthouse is uber famous for the many celebrity cases that were held here over the years. Just a few of the scandalous court cases included Mick Jagger, Keith Richards John Lennon and even Oscar Wilde. The hotel has even kept three of the jail cells, which they have converted into small VIP rooms for small groups to enjoy cocktails at the Jailhouse Bar. Inside the jail cells they have painted on the walls the famous twin gangster brothers Ronnie & Reggi Kray and the other cell is dedicated to street artist Banksy. Downstairs there is a large game room with a bowling alley, a movie theatre and an indoor pool. If you are going to London with or without kids and want to stay in Shoreditch, I can highly recommend this hotel. For brunch we went to the GRIND, The Breakfast Club (we ate here twice), Attendant and Adina. 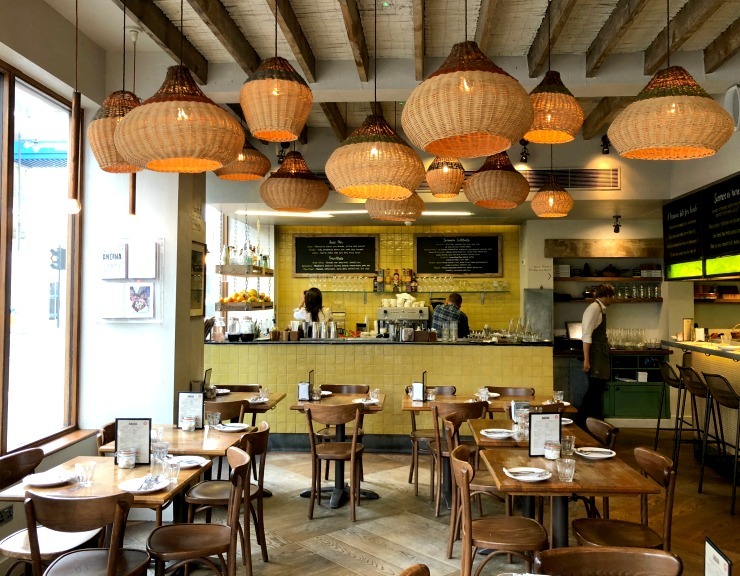 For dinner we met friends at Merchant’s Tavern (Angela Hartnett’s restaurant, a protege of Gordon Ramsey, oh la la), The Frog Hoxton (Chef Adam Handling), we could not get a reservation at Dishoom, but they have a few in London and we hear it is THE PLACE for Indian food. 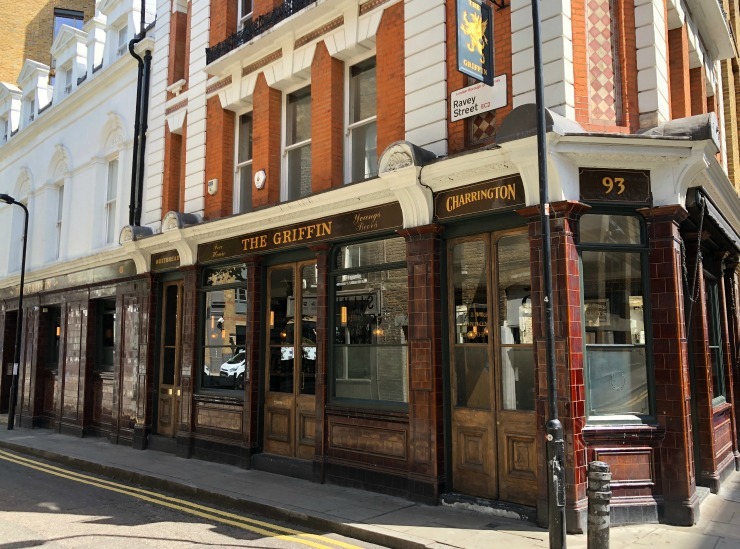 There are tons of low key beer gardens, and plenty of chic bars with fancy cocktail menus, but if you want a classic English pub, head to The Griffin. We had drinks with a friend’s brother who lives in Shoreditch at The Griffin and he confirmed how ultra cool this neighborhood is right now, they just had a baby, and are looking to move. HA! You will not go hungry or thirsty in Shoreditch, I promise you that. Walking around Shoreditch is THE thing to do. 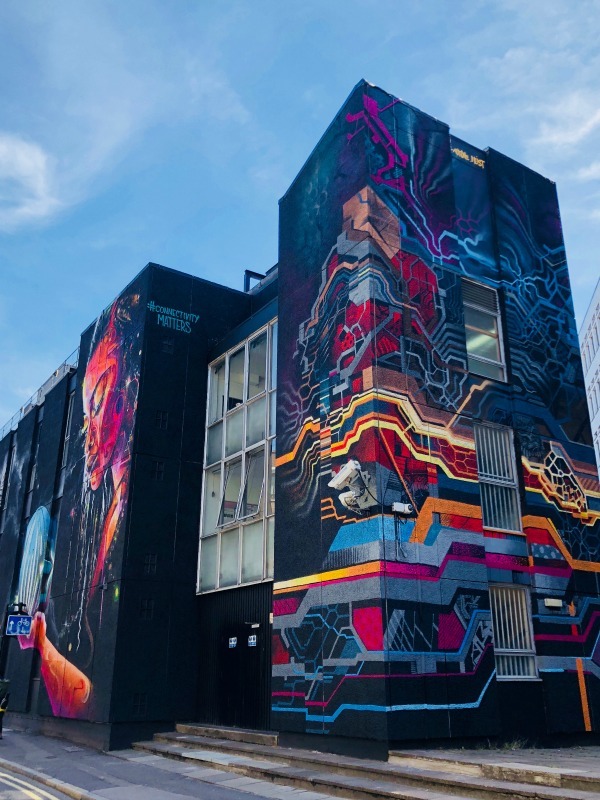 You should go there to take in the street art and large murals, eat brunch, wander the shops, grab drinks at a few of the bars or go for dinner at one of the fantastic restaurants. Last summer we stayed in Notting Hill and saw at least five “grammers“ doing photoshoots in front of all the colorful houses – I am happy to report that I did not see one grammer photoshoot over in Shoreditch. Although Soft Serve Society ice cream (the most Instagrammed ice cream) is at BoxPark, so anyone going for the iconic swirl ice cream with wild toppings is probably going to post about it. We met up with my friend Katja and took the kids, but I refrained from posting a photo. You’re welcome. 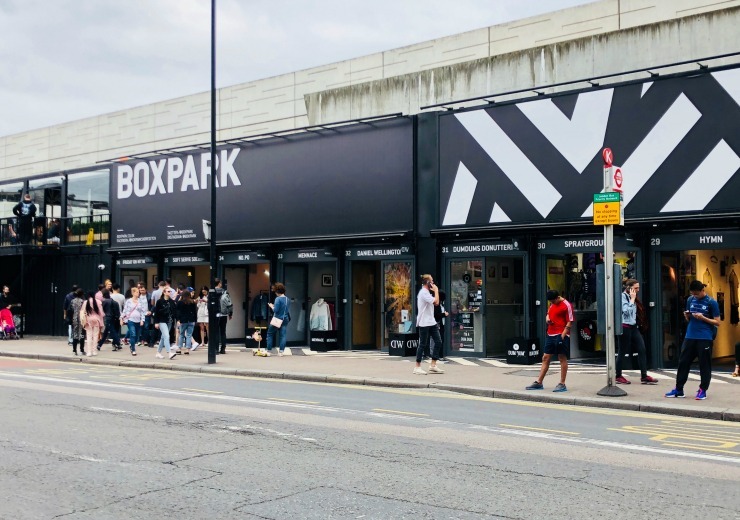 You should definitely go to Box Park, (it’s a pop-up mall made out of shipping containers) and cruise all the little shops. We found the coolest backpacks at Spray Ground and bought Hudson one for school. 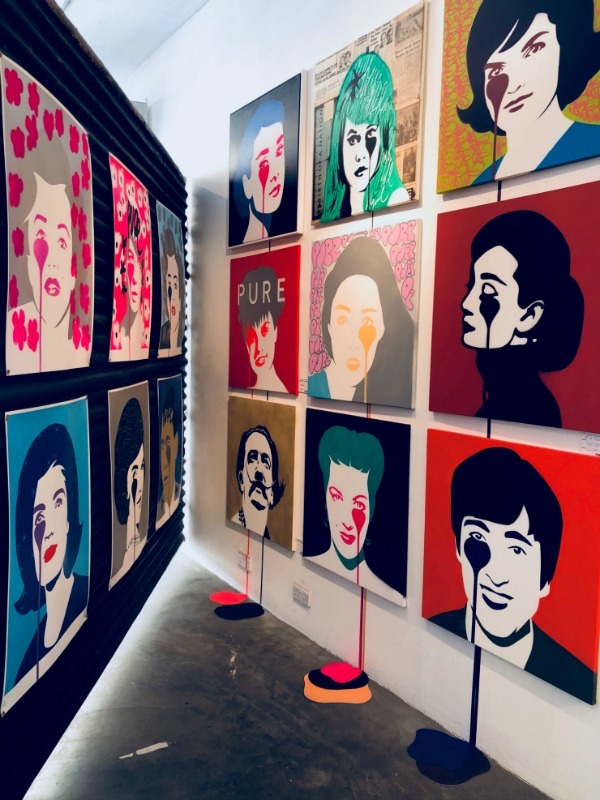 Make sure you also stop in the Pure Evil Gallery, and the shops Anatomē, Wa Green and Sneakers N Stuff. 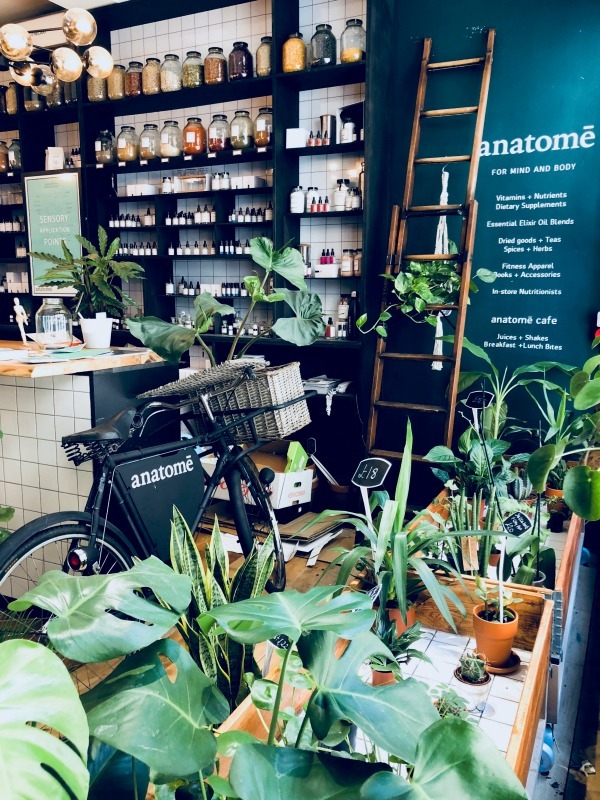 Even if you decide not to stay in Shoreditch, it is definitely worth going there to spend the day wandering around taking it all in. 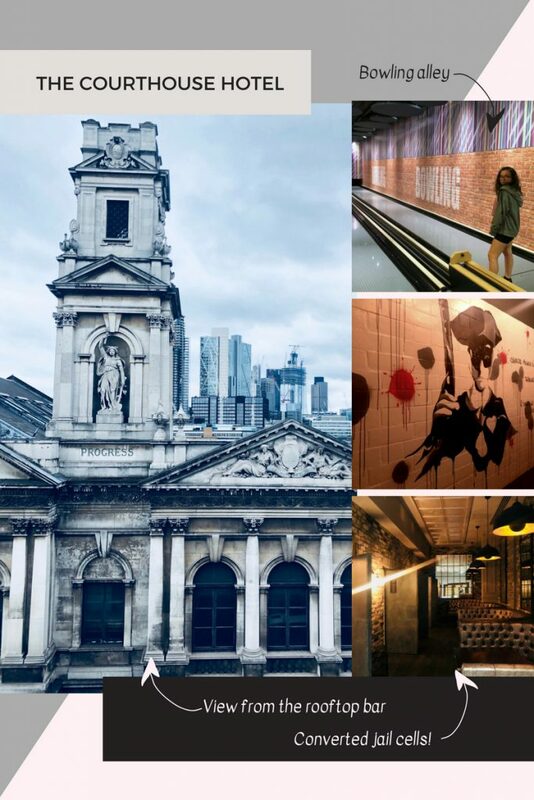 I LOVED Shoreditch, because I am a person who loves finding the gems and getting off the tourist path, I’ve also been to London a few times, so discovering neighborhoods like this is my happy place, sorry Buckingham Palace. What I’m starting to realize is, that as much as I like to hear about the history and story of places, I am much more interested in what is current, what is happening now, what the future is bringing. How it’s all evolving is fascinating to me. 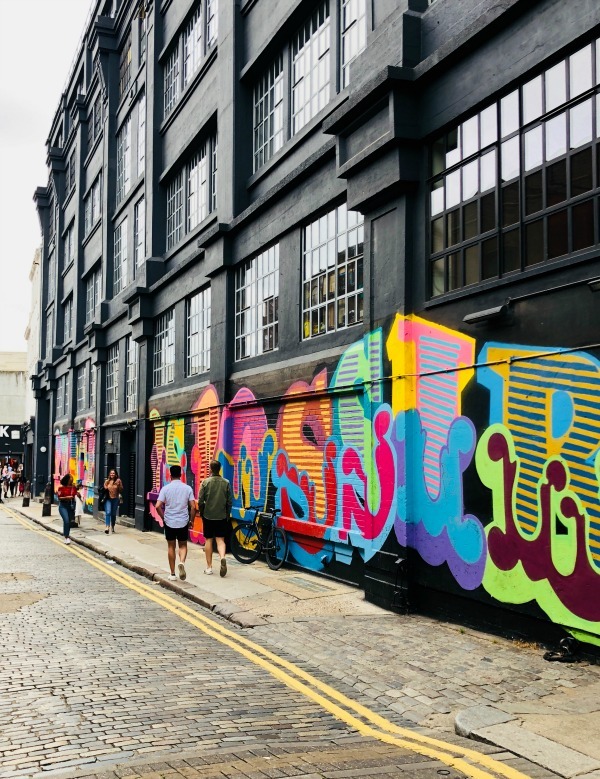 Shoreditch was a visual stimulating carnival, and the best part is – if you go, a lot of the street art will be different. It literally changes daily. I hate theme parks, but I LOVED Volcano Bay!